My recent Dark Ages: Vampire game ended recently, thanks to an ambush that went horribly wrong and ended in the entire party getting killed. I’m still rather bummed about that, but I've instead decided to move on with a new game. I've decided to try my hand at one of the more elusive games I've ever done, which is a Super-Villains game. I've been in a few games that have tried to make this genre work, but it’s never really worked out. But, I think I have an idea. The basic setup is that the world is a fairly classic 4-color superhero world—you have heroic capes flying around beating up super-powered psychos, bank robbers, and the occasional alien invasion. 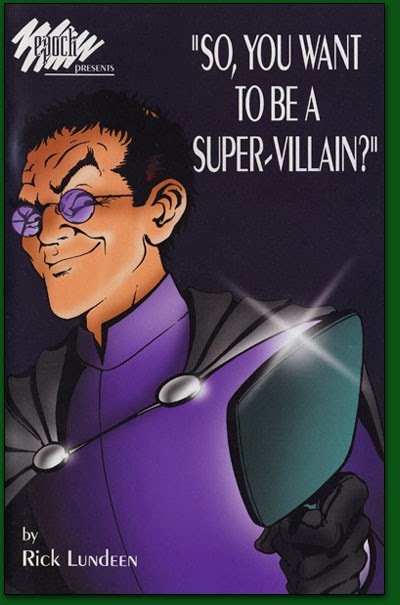 Most villains are of the classic mutant extremist/bank robber/crime lord type. The PC’s, however, are different. They’re mercenaries, Villains for Hire, who travel the world looking for the best jobs, and getting paid well for their dangerous and highly specialized work. The game so far is called “Hero Hunters” but taking out heroes is only one part of what they’ll be up to. They’ll be taking out other Villains, particularly those who crossed the wrong person or group or just those who are so dangerous and outside the line that even the mundane government is happy to pay a bounty for them. They’ll also be working for corporations and nations to take out terrorists (or freedom fighters, the PC’s are, after all, the bad guys), rebels, pirates, and other assorted criminals. If you’re a powerful figure with money to burn and someone you want taken out or something “retrieved”—then you've got a friend. So long as the check clears. Mechanically, I’m going to try using Heroes Unlimited, 2nd Edition. I've had this game for a while, and never really played with it much. I ran a brief Palladium Fantasy game a while ago, and it was pretty fun. Also, my regular group of players has recently been getting into some ruts with their characters, and I think some nice randomness could help liven up the game. Setting wise, I’ll be placing it in our world, probably sometime in the mid-90’s. First, this lines up with the costs and tech levels presented in the main book, so I won’t need to explain how a voice-activated mini-computer the size of a book costs like a million dollars in the rules, only to have the players look at their phones and go “um…dude?” Secondly, it lets me play up the alternate world element and have a bit of fun and fantasy in the setting. Finally, this game will have a “win” condition. The players are merc’s who are in it for the cash, which means that the game is over when they retire and can live like rock stars for the rest of their lives. To reflect this, I’m going to steal from Shadowrun and its lively lifestyle rules. Each tier of lifestyle has a cost and each tier is correspondingly “better” (in a capitalistic/consumer definition) and more luxurious that the previous. Players can permanently “buy” a lifestyle by paying 100 times its monthly cost. The goal of the game, therefore, is for the players to earn at least 10 million dollars, or 1 billion if they have any real ambition. And, yes, I’m aware the numbers aren’t terribly real-world realistic, but it works in Shadowrun, so it should work for me.